The Dodecanese Flotilla is an irresistible proposition for more experienced sailors with a combination of some of the better known and more cosmopolitan Greek Islands such as Kos with its noted ancient sites and great beaches, and of some of the smaller and lesser known gems of the Dodecanese such as Nysiros, Halki or Symi. Sail either the Kalymnos Route or the Symi Route starting from Kos . Saturday: Kos – Arrivals and Departures: Kos is the home of the father of modern medicine Hippocrates and the ancient ruins of the Asklepieion medical complex are a must. In Kos town you can hire a bike as the best way to explore. Sunday: Pothia-Kalymnos (17 nm) - Known as the island of the sponge divers. The bustling harbour town boasts several museums, and a lively neoclassical sea front. Monday: Lipsi (30nm) - The largest of a small group of islands to the south of Patmos, explore the local market for thyme honey and other local specialities. Tuesday: Patmos (12 nm) – Visit to the monastery of St John or alternatively the smaller island of Arki and the quiet village of Port Augusta, a sleepy little spot with just two tavernas ashore. Wednesday : Leros (21 nm) – We moor in the marina in Lakki, on the south west side of the island. Evidence of Italian occupation is obvious in the town, with a good range of facilities ashore. 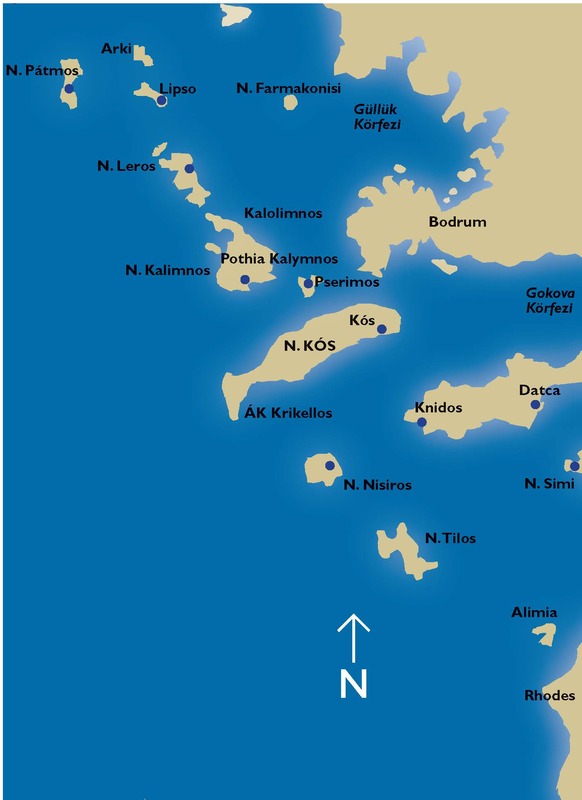 Thursday: Free sailing (35 nm) – Heading towards Rhodes, you can choose to stop in Halki, or alternatively the quiet bay on Alimia, if the weather is favourable. Note: Greek sailing holidays: Routes may vary during the season according to weather and operating conditions. The flotilla crew will keep you fully briefed each day. Also see Itineraries under Info & Booking Conditions. Saturday: Kos– Arrivals and Departures: Fly to Kos and transfer to the flotilla base for embarkation. Tuesday: Tilos (20nm) – The epitome of a traditional Greek Island with nice beaches and a friendly ‘far from the madding crowd’ feel. Tilos also hosts an internationally protected bird sanctuary.panoramic view. Wednesday: Symi Town (24nm) The stunning harbour of Symi is a great place to sail into. The amphitheatre town retains its’ traditional character and charm having been much renovated over recent years. Be sure to climb the steps to the church for a superb view. Thursday: Free Sail Day – If you didn’t make it to the volcano , you could take a trip to the caldera. Enjoy lunch in the town and then a walk around the monastery. Friday: Kos (25 nm) – Hire a bike to explore this attractive resort town and nearby beaches. Farewell evening ashore in lively Kos town. Note: Greek sailing holidays: Routes may vary during thipsie season according to weather and operating conditions. The flotilla crew will keep you fully briefed each day. Also see Itineraries under Info & Booking Conditions. Sunscape Yachting are able to offer Saturday daytime flights from Gatwick, Stansted and Manchester to Kos with afternoon return. Flight time 3 hours 40 minutes.